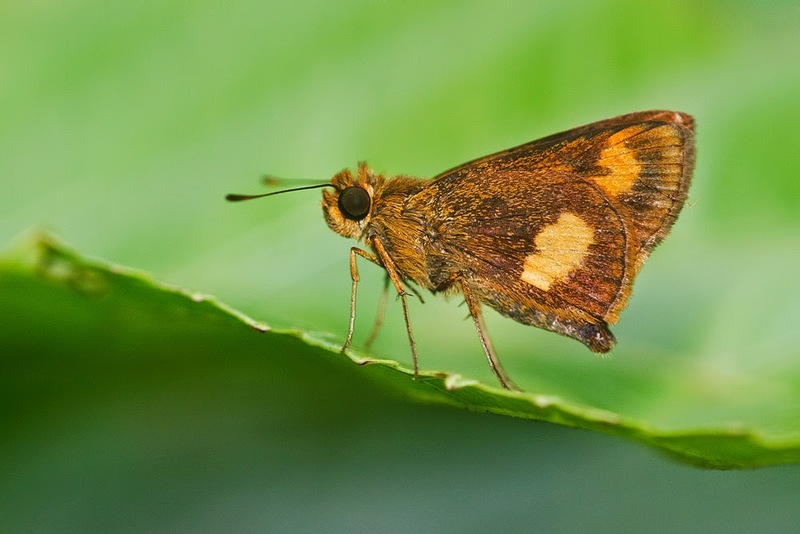 It stirred up quite a bit of hype when it first appeared in Singapore in 2011; Serene Ng, Senior Biodiversity Officer of the National Biodiversity Centre of Nparks took a picture of a strange skipper - dark ochreous brown with clearly defined orange patches on both wings. It was a Malay Dartlet, a new discovery! I remember rushing over to the place it was found the weekend after the news reached me. I never got the shots I was after during the time that the Malay Dartlet colony was there but just recently, three years later, I saw it again - and this time it came to me. 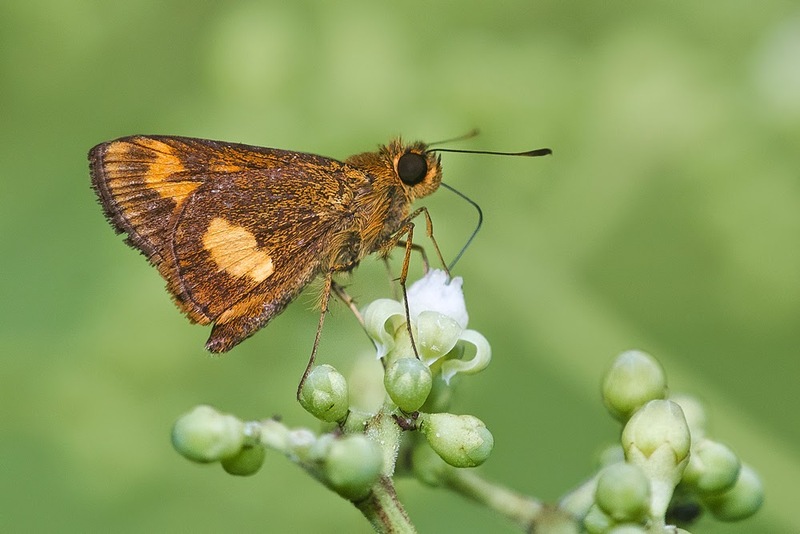 I was shooting some moths attending to an array of Leea indica flowers, when a skipper began circling the bush at rapid speeds. I was shocked to see a Malay dartlet when it landed - I was in Dairy Farm Nature Park; far away from where it was discovered so many years ago. It was shortly joined by yet another Malay dartlet. They stopped at each flower for just a few seconds before moving on to the next but always came back to the same few favourite blooms. After five or ten minutes of feeding, they would fly off somewhere to sunbathe or rest in the shade. It is encouraging that this rare butterfly has spread across the island and is no longer confined to a single grassland. However, it is not all that surpising on hindsight. The Malay dartlet caterpillars feed on a common grass, Ottochloa nodosa, that is found in many places here. Regrettably, I did not scout the area for that grass. Having two of them there could mean that they are breeding nearby. I will just have take note the next time! And for a window into the Malay dartlet's fascinating life history: Uncle Horace's wonderful post. PS: It's been a while since I've posted! Sorry for those two dead months. School's getting busier and I will be taking my exams in a few weeks. Oh well. Great to hear that the dartlet is spreading across Singapore. It is interesting that until four years ago we didn't have any skippers here. Now we have two that have spread up from England. It is good to know that butterflies are extending their range all over the world. You seem to have an endless stream of exams. Good luck with the latest batch.